Exhibition hall of the Spiritual and Cultural Center was opened in the lower church of the Holy Dormition Cathedral in Poltava on November 27. The hall serves as place for displaying icons from the 18th through 20th century that were preserved in private collections. 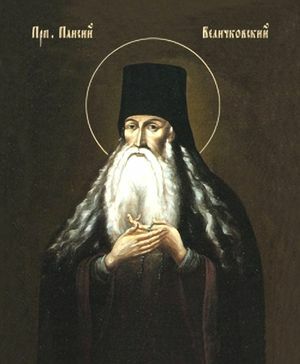 Poltava Eparchy of the Ukrainian Orthodox Church of Kyivan Patriarchate timed this event to the 290th anniversary of the birth of Saint Paisius Velichkovsky (1722-1794), who came from a famous Poltava priestly family. His grandfather (well-known Baroque poet Ivan Velichkovsky), grandfather, father, and older brother were superiors of the Dorminition Cathdral. On the occasion of the opening of the exhibition the head of the Ukrainian Orthodox Church visited Poltava. His Holiness, the Patriarch of Kyiv and All Rus-Ukraine Filaret hallowed an icon of a prominent religious devotee, painted by the artist Kim Skalatsky using a portrait from the 18th century. Relics container with a small amount of the imperishable relics of Velichkovsky is mounted in its frame. “Doctrine of Paisius Velichkovsky is important because it showed the way to the eternal life and gave an example of how to live on earth. This does not mean that everyone should go to a monastery, but it does mean that everyone should think about the good, the sanctity, and purity of heart. Why did Saint Paisius retire to a monastery? He did it in order to cleanse his heart from all evil and sin and he managed to do it right. He became a devotee who can teach how to live and see God. Only a pure heart and not a sinful one can see and feel Him. The importance of Velichkovsky’s life is not only in that he prayed for us sinners, but also in that he showed us the way every Christian should be going,” said Patriarch Filaret. In concelebration with bishops Patriarch Filaret celebrated the Divine Liturgy in honor of the ascetic. Opening of the Spiritual and Cultural Center, which was named after Velichkovsky has not only educational purpose, but also a certain symbolic meaning because, as was mentioned to those present at the event by Archbishop of Poltava and Kremenchuk Fedir, the Orthodox Saint left Poltava in early adolescence and only now he, in imperishable relics, returns home. “In his autobiography Velichkovsky wrote about how his mother saw him off from Poltava to Reshetylivka, where they spent a night. Then there was a touching farewell of a mother to her son. He asked her forgiveness, knowing that he will never come back and will never see her again. The heart of his mother felt that. They said their good byes and Petro [secular name of Velichkovsky.– Ed.] went on his journey choosing Christian service,” said Archbishop Fedir. Honoring the memory of “Poltava Native,” this is how Saint Paisius Velichkovsky signed his letters, Poltava Eparchy of the UOC-KP also established a “nominal” prize. It will be awarded to people who contribute to the revival of spiritual life in Poltava, actively work in the public sector, science, art, and culture.